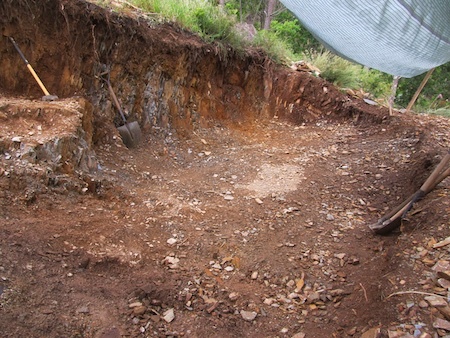 Back in July 2012 we dug a chunk out of the mountainside in preparation for a ferrocement rainwater harvesting tank. Plans for the tank were later shelved due to budget constraints, but a good use for the site was never in doubt. 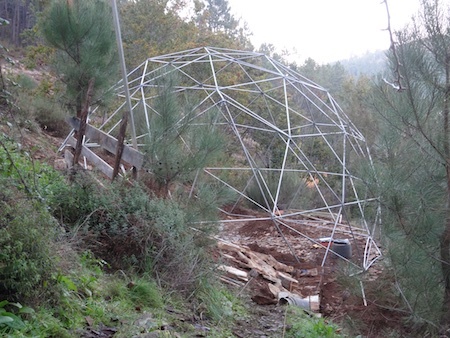 It’s one of the few parts of the quinta to have sun at winter solstice, so was perfect for a greenhouse. The site as it stood was suited to a rectangular structure. A couple of years ago I figured I could use the frame of an old cottage-style tent to make a greenhouse. 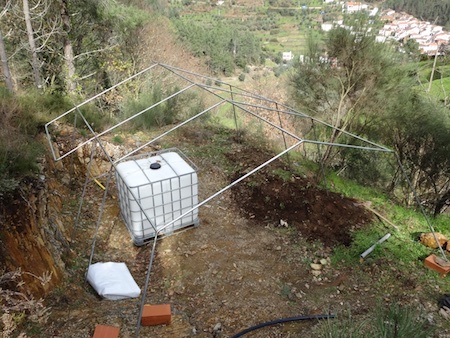 A southeasterly gale soon convinced me it wasn’t up to the task. 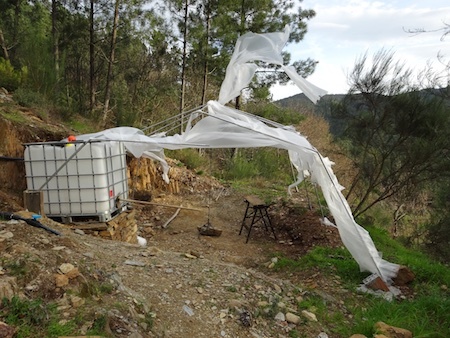 But both the tent frame and an off-the-shelf polytunnel would be missing the opportunity to use the thermal mass of the solid bedrock back wall of the site within the structure. 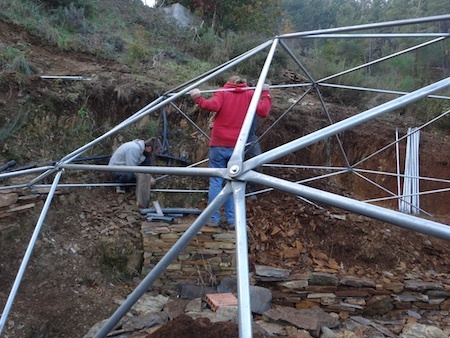 I went looking for second-hand polytunnels online thinking I could remove the legs down one side, but I couldn’t find any with the right dimensions and somehow it didn’t seem a very satisfactory solution anyway, especially since the back wall wasn’t a consistent height. The only answer seemed to be a bespoke construction. 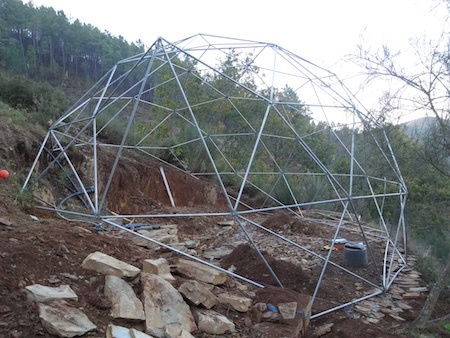 Liam, the engineer of the water tanks here, also builds geodesic domes for festivals and the like. 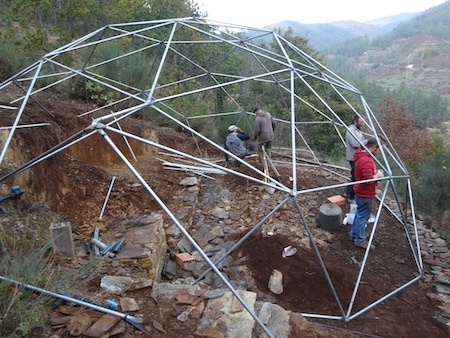 We’d often discussed the idea of a geodesic dome greenhouse. It would be different, but far more importantly, did it make sense? 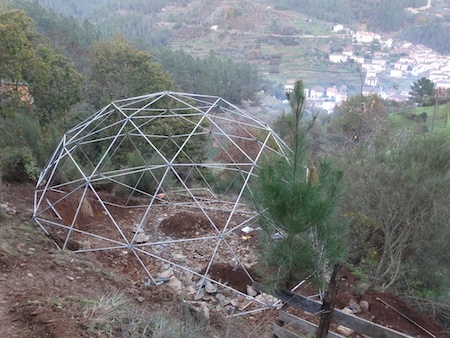 I played around with drawings and Sketchup models for a while, seeing how easily I could fit in all the things I wanted to fit into the greenhouse, and came to the conclusion a dome was by far the better option. 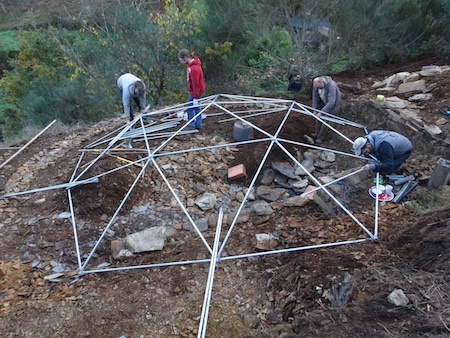 Its height allowed for many different internal levels for cultivation which made much better use of the site than a polytunnel or some sort of rectangular construction could. Turning the bedrock back wall into a curve would increase the surface area and absorb more heat. If the different levels were built with stone and filled with the rubble we removed, it would increase the amount of thermal mass still further. 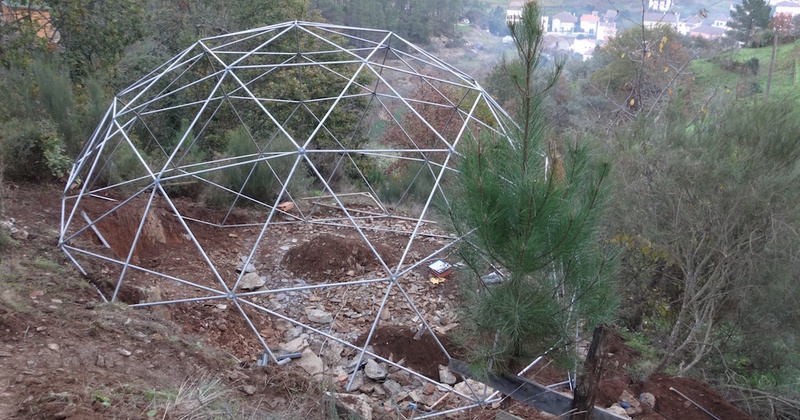 The dome shape also offers much better wind resistance. 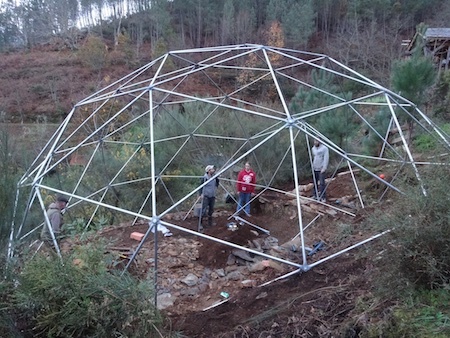 And Liam could build the dome to the site, so we could accommodate the changing heights of the back wall and extend it over an outcrop of particularly solid bedrock at the entrance. Doing this, we figured we could just about squeeze in an 8m 5/8 3V with part of it cut away to fit the slope. This on a site which measured roughly 7x5m at outset. 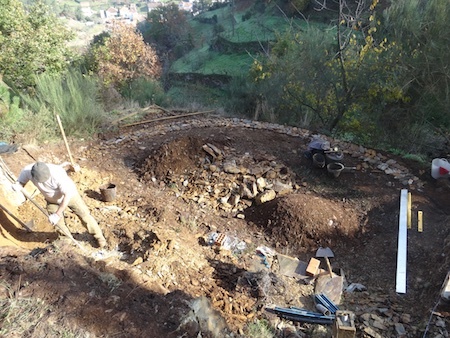 So at the end of 2015, work began on site preparations, removing more of the back wall to turn it into a curve, and shaping the downhill side of the slope to accommodate the front edge of the dome. I was able to fine-tune my Sketchup model as I prepared the site and then work from it. Meanwhile, Liam made the frame using the same model. This is super cool! Definitely plenty of space in that thing to fit all your favorite plant buddies. Have you finished it yet? Wish I could see pictures! By the way… What material are the bars? Thanks. No, not finished yet but nearly done with the groundworks. There’ll be more posts as we move on with it. The bars are galvanised steel tubing.